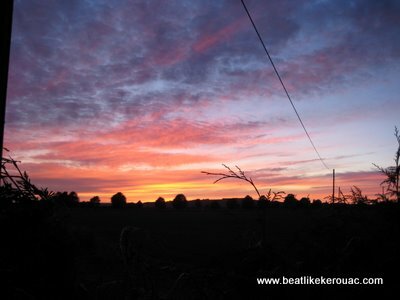 English Reflections | Beat Like Kerouac – now with child! ← Cockney Rhyming Slang – A National Treasure. As we stepped out of the Barcelona airport today into the warmth of a Mediterranean climate, I was grateful for the sun, albeit sad to leave a country as ancient and mysterious as England. We Americans don’t give England enough credit as a vacation destination, or in any other way, for that matter. It is a land so full of tradition, history, and camaraderie that too many don’t even notice it anymore. I suppose people can get used to anything. New Yorkers sleep soundly amid the noise of the city. Texans hear coyotes howling at night. Australians don’t mind the heat (it’s a dry heat after all). Icelanders ignore the gigantic variations in daylight hours throughout the year. The English pay no mind to thatched roof cottages, quaint and lively pubs on every corner, and buildings and villages that are not only centuries old, but are still used to conduct business, house royalty, serve drinks, and sell trinkets as if they were built in this lifetime, not in the lifetime of someone who drove a horse and buggy down a dirt and cobblestone street and perhaps even worshipped Pagan gods. I love all this about England. I love how it can be such a thriving modern place and still keep its history perfectly intact. In contrast, it seems that historic buildings in younger countries, like America and Australia, seem to rarely be adapted to fit new lifestyles, but instead are roped off as museums or left to rot away. Perhaps it’s because there are simply less of them to choose from, or maybe we have yet to master adapting (then accepting) such places with all their quirks, into modern life . This week in England we were able to experience this history amid the bustle of London, the gilded pageantry of Windsor, the quiet beauty of the countryside and the ancient mysteries of Avebury and Stonehenge. Each part had its highlights and similarities (a lengthy history and an abundance of pubs – for more on English pubs see Marcus’s earlier post – the boy really is obsessed) but some amazing differences as well. London is London. It’s busy, expensive, full of tourists, and has very small hotel rooms. It also has the Tower of London, where Anne Boelyn was executed and the Little Princes were hidden, Big Ben and the Houses of Parliament, and Westminster Abbey (the site of not only the tomb of Edward the Confessor but the wedding of William and Kate!). So no matter your motivation, you must see it. Like maniacs, we toured all of the above in London in two days, then packed up our rental car and headed to the tiny town of Pewsey, in “the West,” in the county of Wiltshire. Once we were in the country, we were much more at ease. The tourists were gone. The air was clean. Driving was generally less stressful and beautiful due to the scenic fields and “tree tunnels,” where the trees reach a point over the road, creating a darkened glen. But the fact that roads were extremely narrow and lacked a shoulder of any kind (most of them are sunken you see, from hundreds of years of being driven on, by cars, oxcarts, and the like) made for a few frantic moments. In addition to locals whipping past, I was almost waiting for Robin Hood’s merry men to jump out around the next bend and demand a portion of our gold. Every so often we would come to a tiny town, a town you knew hadn’t changed much since Victorian, or even medieval times, because the streets were extremely narrow and many of the buildings sported real (not fake facades) Tudor beams or thatched roofs. Ah, the thatched roof; the material of choice for rich people in England and poor people in Africa. It stole my heart with its Hobbit-like cuteness. Often accompanied by whitewashed or brick walls and beautifully tended gardens of red roses, it caused backdrops from fairy tales of my childhood to spring back into conscious memory. I always thought those storybook illustrations were the old-fashioned fantasy of some random children’s author, but no, they’re real. The author was probably English and not nearly as imaginative as I originally thought. Lots of thatched houses still exist and new ones continue to be built in the old style. Made mostly of wheat, thatching must be done by a highly skilled professional, and upkeep is necessary. If this is done, a good thatched roof only need be re-surfaced every fifty years or so, and the interior thatching need not be replaced at all. There are houses in England with interior thatching up to 500 years old. Sigh. A few mornings during our stay, Marcus and I went for a jog amidst the neighboring houses, marveling at the care and dedication with which they’ve been maintained over the years. These houses, combined with the friendliness of their occupants at the neighborhood pubs, almost made me want to move to the English countryside. Then it started to rain. The rain and the accompanying mist set the perfect mood for a day of exploring prehistoric stones, in the way of the Avebury circles and Stonehenge. Stonehenge is amazing, and like the pyramids of Egypt or Niagra Falls, must be seen. But the tourists surrounding it and the military precision needed to execute a visit make it much less of what it should be – mysterious. For this reason I, like so many guidebooks, prefer and recommend Avebury, where the stones are older than Stonehenge, open all the time, free, and available to touch, since they’re in the middle of a sheep paddock. The sheep do a good job of mowing the grass, but not such a good job of picking up after themselves. 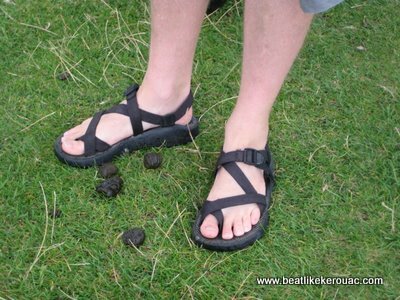 So after you’ve had a feel of the aura of the stone circles and given alms to the goddess, make sure to check your shoes for poop. The rain finally let up and we found ourselves at Windsor castle, the epitome of the storybook castle and a pilgrimage for anyone who has ever read a fairy tale or gave two hoots about the English monarchy (Marcus is most certainly not one of these people. “Bloody monarchy, grumble, grumble”). 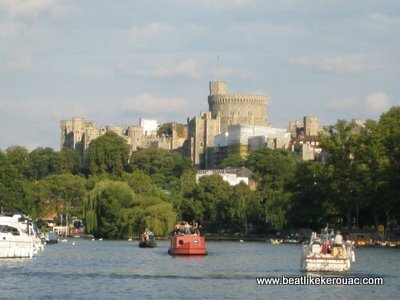 The first castle was built at Windsor by William the Conqueror in 1088 has been added to by various monarchs ever since. The accompanying St. George’s chapel is a feat of architecture on its own, but also contains the tomb of Henry VIII, next to his favorite wife, Jane Seymour. Personally I think she was his favorite for only two reasons. One, she bore his only son, who didn’t really amount to much, and two, she bolstered his ego by being all timid and submissive. Snore. I, of course, am more the fan of the ill-fated Anne Boleyn and her plucky little redheaded daughter, Elizabeth I. We moms of plucky redheads must stick together, after all. My plucky redhead was happiest to see the changing of the guard. The classic soldiers in their red coats and tall fluffy hats have a new fan in Lily. “Watch soldiers!” became the request of the next three days as we re-played the video of their marching into and out of the castle at length. Throughout the tour of the glorious staterooms of Windsor, even the uneducated monarchy fan can learn a lot; the tragedies of Charles I at the hands of Oliver Cromwell’s rebels; Queen Charlotte, who, had she lived, would have ruled instead of her cousin, Victoria. The triumphs of Elizabeth I, Charles II, Victoria, and the current Queen Elizabeth, who, if she survives until 2013, will surpass her great-grandmother Victoria as England’s longest ruling monarch, with 64 years on the throne. I think she has a pretty good shot, considering her mother lived to age 102. As an American, it’s pretty impressive to me that a monarchy (regardless of its old ladies) can survive so long, and thrive in the current climate, but I think that just reiterates what I like about England. Through its amazingly long past, it is able to keep ahead of the curve and not get left behind, while retaining its history like no other place I’ve ever visited. So I’d like to sign up for a thatched roof cottage and a position in the House of Lords, please. I will have a hand-pulled ale in the pub and a red bus to ride on. The guard will change at 11:00 each day and I will hunt white hart (deer) atop my royal steed whilst wearing a red jumper and shiny black boots. You can keep the rain, though. Gallery | This entry was posted in Great Britain, Travel and tagged England, pubs, travel, weather. Bookmark the permalink. I am now homesick for England. I don’t know where I lived there, but I’m homesick for it now. You lived everywhere we go!!! Now England… last time is was Ameccamecca in Mexico.